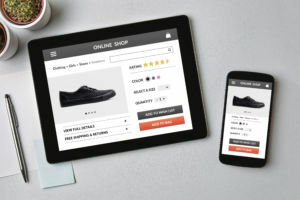 Traditional full-stack commerce platforms limit companies to a particular presentation or front-end experience throughout the entire commerce system. As a result, customer experiences are driven by the system’s capabilities and constraints, and do not necessarily represent the way a company wants to do business. Customizations are challenging to implement and maintain with future product releases. Over time, single-stack solutions grow larger and become overly complicated for developers to understand or make changes to without breaking functionality. Headless advantage: The front-end layer is separate from the core commerce logic and offers maximum flexibility of the experience that is being presented to the customer. Customizations are containerized and don’t need to be rebuilt with each new upgrade. Any front layer is game, be it custom development, content management system or digital experience platform. Single vendor, full-stack solutions can provide adequate implementations when only one or two touchpoints are required, e.g. web storefront and mobile-friendly sites. When adding more touchpoints to the experience, some companies replicate or use separate commerce solutions to support every new touchpoint. This approach creates commerce silos which cannot be easily connected back to systems of record. With business logic spread across silos and systems, this increases the potential for inconsistent customer experiences. Modifications to the systems are required to reduce these inconsistencies. Over time, this results in an unsustainable system with a high risk of failure. Headless advantage: Decoupling the front-end from the back-end allows companies to innovate without needing to replicate the commerce logic for each touchpoint. Leveraging rapidly emerging touchpoints, such as IoT, bots, point-of-sale interfaces, screenless devices becomes easier than ever. This allows back-end systems to evolve as time and budgets permit. When the front-end and the back-end are tightly coupled, every change to the front-end impacts the back-end and vice-versa. In this type of architecture, the front and back-end software are too heavily reliant on each other. Even with an API layer in between, changes to the experience layer often require changes in multiple places, by different developers making them costly, time-consuming and error-prone. At the end of any development, major parts, and sometimes the entire system, must be redeployed. If the back-end of the commerce platform experiences a performance issue or, requires maintenance, this can create downtime for the live site. A single bug can quickly bring down the entire system. Because full-stack systems are slow to change, they limit the ability of a business to respond to market opportunities and meet customer expectations. Headless advantage: The changes in the back-end don’t impact the front-end. The change is needed in one place only and doesn’t require reset of the entire system. Gaining business efficiency and transparency across business units, lines of business, channels, brands and geographies is top of mind among many business executives. Legacy full-stack platforms make it more challenging than ever to gain a 360-degree view of the customer and pivot the business towards a customer-centric model. Many enterprise brands with a global footprint find themselves with multiple siloed instances of commerce platforms and a siloed approach to commerce. With mounting maintenance costs for each platform, delivering one brand experience is harder than ever. Headless advantage: API-first commerce offers unparalleled flexibility when it comes to sunsetting legacy systems and creating a unified selling platform. Replacing one commerce functionality, e.g. pricing, shopping cart after another, unifies the selling with minimal risk to the business. To sum up: Headless, API-first commerce solutions provide business users with the power they need to create new ways of interacting with customers, and new ways to monetize customer experiences without requiring back-end development. Starve your monoliths to death by losing your head now, and embrace experience-driven economy. The post API-first commerce: Why it’s OK to lose your head appeared first on Get Elastic Ecommerce Blog.